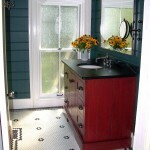 The farmhouse bathroom renovation was done in stages, to accommodate a tight budget. 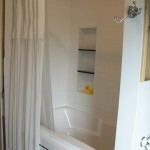 The mismatched shower/tub surround were replaced first due to a large crack in the tub. 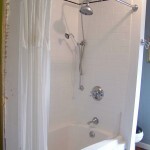 The new shower was installed with gorgeous subway tile and farmhouse fixtures. 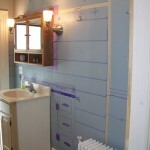 Later, the rest of the bathroom was gutted. 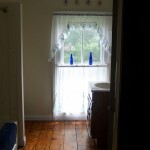 The floor received a heated, black and white hexagon floor, custom-milled beadboard wall treatment, custom made vanity (from the old pine floor boards) with distressed finish and Pietra Cardosa granite with lots of historically appropriate colors and touches. The “new” bathroom all laid out one cold winter day. 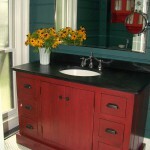 Vanity constructed from antique floor boards – finish is a 7 step custom process to create an aged look. 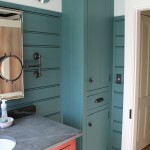 Built In Cabinet constructed from antique floor boards. Hardware is from Restoration Hardware. 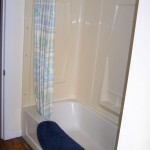 Not sure if the previous owners got a deal or what but the surround did not match the tub (and had a crack held together with duct tape). Pretty pencil detail and ceramic crown at the top. Custom niche with granite shelves (and a place for the duck).